On September 1st, we’ll have our fourth and final online course of Transforming Divi with CSS and jQuery, so act now to become a Certified Divi Frontend Developer for only $197! Over the past few months, we’ve had over 600 students pass through our digital classroom. A large percentage of our students have already completed the course material and are now officially Certified Divi Frontend Developers. This will be the final run of the course where the facilitators are as hands-on as they have been to date, so if you’d like to become a powerful web designer, sign up for the fourth and final intake of the Transforming Divi with CSS and jQuery course. In just a few short months, we’ve had three incredible runs of the course. We’ve loved seeing Divi users of all skill levels, brand new and seasoned, all come together to learn, share and grow, both from and with each other. Beyond the course itself, there have been some amazing exchanges in the private Facebook group, and with the introduction of the webinars, the amount of knowledge and content shared has been incredible to witness. In order for us to make room for bigger and better things, the Divi Space team will be taking a small step from the course. This is the final time that the Transforming Divi with CSS and jQuery course will be available in the hands-on learning format that it currently is. With the Divi Space team facilitating your learning, you’ll be able to catapult your progress by engaging more and receiving answers directly from the course creators themselves. This course has helped me understand how to think in code. (Simple code, I’m no coding genius). Solving web design problems seems like magic when you know how to locate what you want to change (the element), and then how to write the code to target that specific element and this happened for me in the very first lesson. SJ is a great instructor; easy to follow, explaining concepts in a way that creates interest and excitement about the possibilities. Whether you completely understand CSS and jQuery or your a newbie like me, you’ll quickly learn how easily it is to make changes that up until now you’ve spent hours searching the web for answers. Want to move a logo? Change a background color? There are hundreds of tutorials and guides, some up-to-date, some not — and learning to find answers is a big part of learning to design web sites but here you’ve got the benefit of SJ’s expertise, the Facebook group for sharing questions and ideas, and the entire Elegant Themes community. Best decision I ever made. I am a developer that uses Divi almost exclusively. Sometimes when I come across courses like this they are usually so simple that I get nothing out of them. The reason I like this one so far is that yes the content may be things I know or have used before but the explanation and the way it’s taught makes me want to come back and refresh what I know. That’s not to say that I haven’t learned new things because I have. I usually hang out on the ET support forum and help people with issues and I love doing it in my free time but people that are willing to learn will find that the way SJ teaches them how to use inspect element for example and debugging errors etc will probably lead to even DIYers not needing as much help. My point is either way you can learn a lot. Everyone should just take this course in my humble opinion. Join our happy students and become a Certified Divi Frontend Developer! Sign up for the Transforming Divi with CSS and jQuery course now! 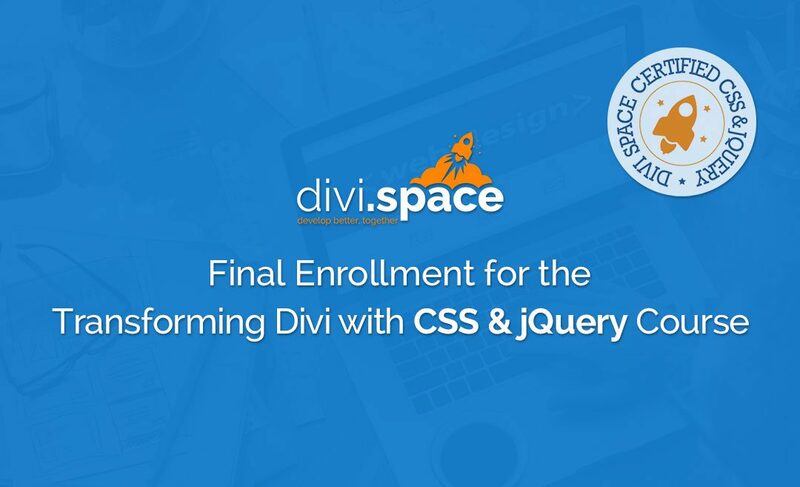 Take advantage of this amazing learning opportunity for only $197 and join the Divi Space team in the fourth and final intake of the Transforming Divi with CSS and jQuery course. The course will open its doors for the final time on the 1st of September. Hi. Will this course be free for Lifetime Memberships on Divi Space..? Hi, will the course still we available online for a while, for those with Lifetime Membership? Or will it be taken offline completly? No the course will not be taken offline, just closed for enrollment. It will remain online indefinitely for those who are enrolled. Hello. I have a lifetime membership. How can I get this course for free? Hi Elena just send an email to suport@divi.space and we will take care of you.